George Panteleon's Iron Man bust is amazing - but the fact that it's made entirely out of Lego just makes it even better. Just look at it! Panteleon used around 700 bricks to build his 24cm-tall masterpiece - a relatively small amount for what is such an intricate build. 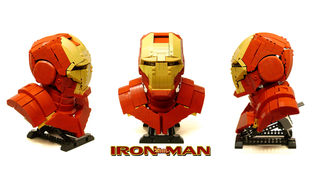 A great use of curved pieces and a technique used by Lego builders called SNOT (Studs Not On Top) gives the bust less of a blocky look and something much closer to the Iron Man of the movies. Not to be outdone by the rest of this excellent build, he even used Lego LED bricks to make the eyes light up. Seriously impressive stuff. The head even moves around! For more pictures of this fantastic Iron Man, as well as more Lego creations, check out Panteleon's Flickr page linked below.